SYRIZA leader Alexis Tsipras was 32 when he burst onto the central political scene in Greece by attracting 10.5 percent of the votes in the Athens municipal election in 2006. At the time, it was unprecedented for such a young candidate, especially one representing a left-wing party, to gain this level of support. Eight years on, and with Tsipras leading SYRIZA, 33-year-old Gabriel Sakellaridis gained 20 percent for SYRIZA in the electoral contest for the Athens mayorship. If we use this as a yardstick to measure the party’s progress, one can only conclude that SYRIZA has made big strides. When Tsipras stood in the 2006 election, many commentators dismissed it as a gimmick and slated SYRIZA leader Alekos Alavanos for wasting such a high profile nomination on an inexperienced hopeful. Sakellaridis’s candidacy was also dismissed by many observers. As a little-known economist who spent his adult life either studying or participating in party committees, much like Tsipras at the same age, it was difficult to see how Sakellaridis could connect with voters. However, SYRIZA is a different beast these days. From the fringe party of 2006, it has emerged into a potential party of power. With trust in the political system at a nadir, SYRIZA benefits from being able to proclaim that its members have not played a part in Greece’s downfall. As voters look for something new, SYRIZA is there to argue that, with its fresh faces and untarnished candidates, it is the answer. Perhaps, though, SYRIZA has benefited most from the chasm-like political cleavage that opened up in 2010. From then on, parties and politicians have been cast into two categories: Pro-memorandum and anti-memorandum. Any nuances that may have existed in Greek politics have disappeared into the gaping sinkhole created when this split occurred. It has made bosom buddies of one-time rivals New Democracy and PASOK, while SYRIZA has explored the possibility of cooperating with the right-wing nationalist Independent Greeks. This polarisation has killed political dialogue and exposed the paucity of ideas in the system. The parties in power have used the terms of Greece’s bailout as a manual for running the country, while the opposition has turned its back on whatever has been proposed. In short, that is how we have arrived at local and European Parliament elections where one side (the government) presents voters with the extortionate dilemma of stability vs uncertainty and the other portrays the vote as a stark choice between freedom or more years under the yoke of Angela Merkel. The parties are trying to make up for their lack of ideas by bringing in new faces. All the groupings have been advertising the fact that the majority of their candidates for the European elections are newcomers. But what good is this when they are bound by the same tired old messages? Journalist Stavros Theodorakis has attempted to bridge the gap between the public’s desire for something new but also something conciliatory rather than divisive. His centrist party, To Potami (The River), posits a new proposition by relying on candidates whose strengths lie in their professional achievements rather than how many rungs up the party ladder they have climbed. It challenges voters to cut the umbilical cord that keeps them tied to the established parties. It seeks to fill the gap in the centre ground of Greek politics abandoned by parties fleeing one way or another to man the barricades of the pro- or anti-memorandum camp. Opinion polls suggest To Potami could come third or fourth in Sunday’s vote. Its remarkable rise cannot be attributed to it being an anti-systemic force. It is far from that: Theodorakis has been very much part of the system over the last couple of decades. Instead, the new party has profited from Theodorakis’s fame and his ability to inject a little feeling into the political debate. It is this capability of ditching the wooden language of other parties and speaking about issues with the air of a regular person that has driven To Potami’s popularity. “At crucial political times, when people are under pressure and calling for change, what they are seeking in actual fact is a release for their emotions,” philosopher and author Stelios Ramfos said recently when commenting on To Potami. Theodorakis is mostly trying to draw support from the same pool of voters that other centrist and liberal parties, such as Drasi, have unsuccessfully attempted to before. They have fallen down because of their off-putting haughtiness. They talk down to people, presenting themselves as an elite that has played no part in the country’s problems and which continues to rise above its daily travails. For all the criticism of the 41-year-old journalist, he is good at portraying himself as just another member of society and has connected with people through his TV shows. 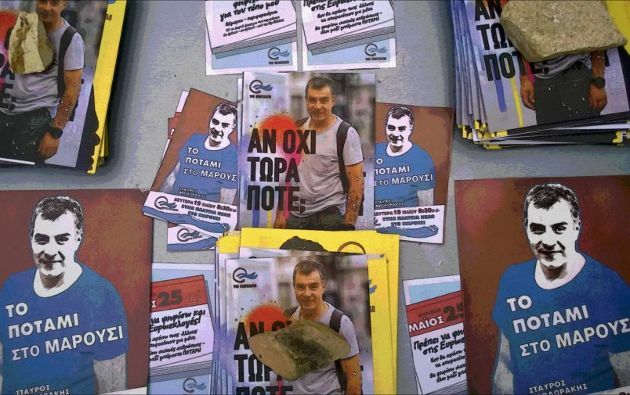 However, on the eve of Sunday’s crucial vote, To Potami’s ideas remain vague. Its policies are not clear and it has yet to decide which grouping its MEPs will join in the European Parliament. At the same time, Theodorakis has yet to give a comprehensive and convincing answer about how his party is being funded. These were things he could get away with in March when he launched the movement but can only be seen as grave compromises going into the elections. Theodorakis is asking voters who have been repeatedly burnt to make a huge leap of faith. Anyone who wants to represent or run Greece must be absolutely clear about the challenges the country faces and have proposals for how to tackle them. Nebulous thoughts will not restart the economy, create jobs or improve the public administration. Greek politics is crying out for renewal but it can’t rely just on an infusion of new blood, be it Tsipras, Sakellaridis, Theodorakis or anyone else. New Democracy nominated one of its younger members, Aris Spiliotopoulos, to run for the Athens mayorship but his lack of ideas led him to adopting a hard right agenda that was rejected by voters in Sunday’s first round. The bitter divide over the memorandum has exposed the shortcomings of Greece’s political system, which has now moved into a phase of self-regeneration. This new crop of politicians will encounter the next major cleavage of Greek politics, which will be how to construct the post-memorandum Greece. This means tough decisions will have to be taken on key issues such as healthcare, social security, taxation, labour rights, and public sector reform. Greece will have to be built in the vision of its policy makers rather than according to the troika’s instruction sheet. Youth or the lack of political baggage will not be enough to mark out those capable of living up to the task. New faces with old ideas will just take us back to where we started.